(CelebrityAccess MediaWire) — Two newly formed funding organizations, the Gretchen Valade Endowment for the Arts and the Detroit International Jazz Festival Foundation, will provide a $10 million endowment to ensure the continuation and growth of the Music Hall Center for the Performing Arts in Detroit. The new festival foundation is already planning a larger, more expanded 2006 Detroit International Jazz Festival that will build upon the 2005 festival and will take place in downtown Detroit Labor Day weekend, September 1-4. The new festival foundation will provide staffing for nearly all aspects of festival activities including programming, marketing, sponsorship and operations. The transference of the day-to-day responsibilities of the Jazz Fest to the foundations will enable Music Hall to concentrate its efforts on programming theatre, dance, concerts and educational programs in the historic venue. 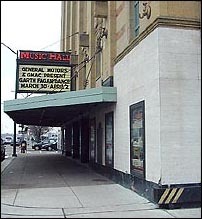 Although the new festival foundation will now be responsible for producing the festival, Music Hall will continue its participation in the festival by continuing to manage the youth education aspects of the festival, including programming scholastic bands (400 student musicians) and overseeing educational outreach opportunities. In addition, a number of Music Hall trustees and other community members will assist the Jazz Fest by serving on the festival foundation's general advisory committee. As part of its further partnership with Music Hall, the Gretchen C. Valade Endowment for the Arts and Mack Avenue Records will serve as major sponsors of a new Jazz concert series that will be held at Music Hall during the course of each year. "I am delighted with these developments," said Alex L. Parrish, chairman of the Board of Music Hall. "This is a real step forward for Music Hall and the Detroit International Jazz Festival, but also for the City of Detroit and our area. Gretchen Valade is showing the kind of generosity and community leadership that I hope will serve as a model to many others who also have the capacity to make our community a stronger, more vibrant place to live and work."